Wild: Moschops cibumutante in the wild is a lethargic, cowardly creature that primarily lives in the forests of the island, primarily making its home among the great redwoods of the West. It survives by being extremely flexible in its eating habits and completely averse to fighting. It never starves, since it can eat just about anything. Moschops runs at the slightest provocation, but is still often preyed upon. Domesticated: What makes Moschops particularly interesting is what it can be trained to do with its eating habits. With a versatile palate and tough teeth, Moschops can be tamed for a unique ability: over time it can be taught exactly which things to gnaw, increasing the likelihood of harvesting that exact resource which its master desires. For example, teach it to prioritize chewing Prime Meat, and Prime Meat will be easier to harvest from the flesh it consumes. Likewise for rare plants materials, and so forth! Known Information: Just don’t expect Moschops to protect you, though. Even after taming, it will quickly flee when enemies are nearby. Regardless of being fed well, increasing its strength, or how much affection you shower on it–Moschops retains its inherent cowardly nature! The Moschops can be trained to prioritize harvesting a specific material. As an example you can use it to get more prime meat from carnivores, or to get specific (rare) resources from plants. 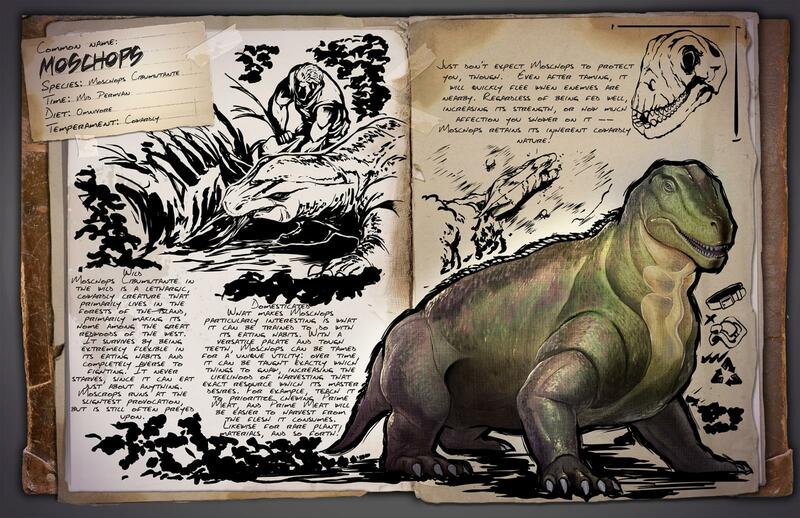 Looking at this, it seems that we might need a whole team of Moschops to be able to effectively harvest any item we want.